When the scandalous Lord Blackstone returns to London, fashionable ladies cast inviting glances his way and his friends celebrate his infamous exploits. No one guesses that the lurid tales of his harem and the famous painting of his voluptuous mistress are a cover for an honorable promise and a secret mission to stop a deadly foreign agent. Violet is the heiress to a banking fortune who’s brother, Frank, has gone missing, and Blackstone has been hired by the government to find out why and where he went. He does this while posing as Violet’s fiancé, all of which is complicated by their past relationship and the way things dissolved between them. 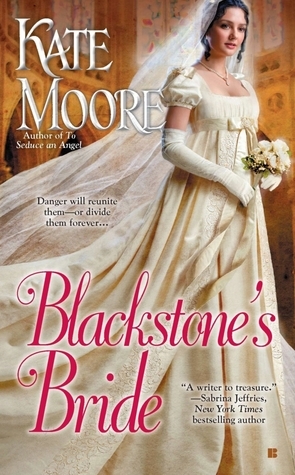 The tension between Violet and Blackstone is written extremely well, and the changes that take place in the relationship are written with a subtle hand, making it fun to read and experience with them. A large part of the novel is spent clue-searching by Violet and Blackstone and trying to figure out who is the actual bad guy. However, because Violet is still very young in many ways, her impulsiveness and inability to see past the obvious, coupled with her outright cold treatment of Blackstone often left me wondering if she was going to blow her cover. Blackstone, on the other hand, with his life experience is all nobility and heart disguised as a rake who continually fights an internal battle between playing the role he has been given and giving into his heart. Both parts are well written and kept me page turning. I did struggle, however, with the stiffness of the characters through the first 2/3 of the book. Even once they kiss each other, the battle and tension don’t subside any and it wasn’t until the couple decide to address their baggage and actually speak about the past that things begin running much smoother for them and for the case. This was a relief for me because the internal battles were starting to overshadow the story line. I found this book to be a intriguing and fast paced read once I got pass the first two or three chapters which weighed things down a bit. I found the characters to be entertaining, if not a 100% believable, and the story line interesting, if not entirely plausible.